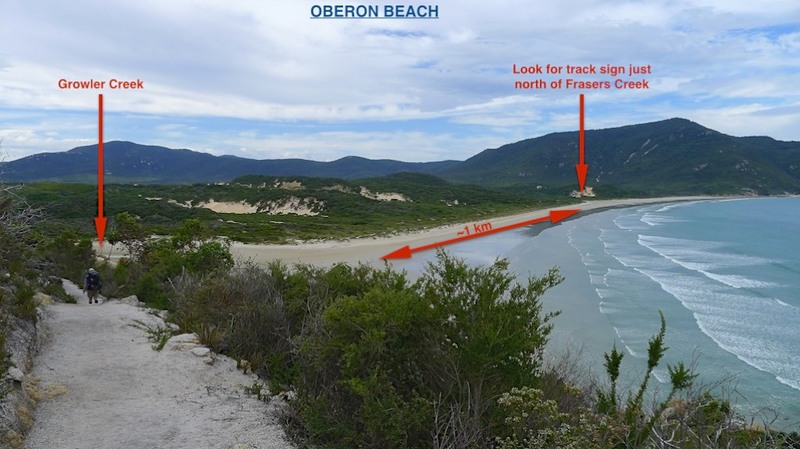 O is for Oberon – today Oberon Bay and Mt Oberon were our goals. 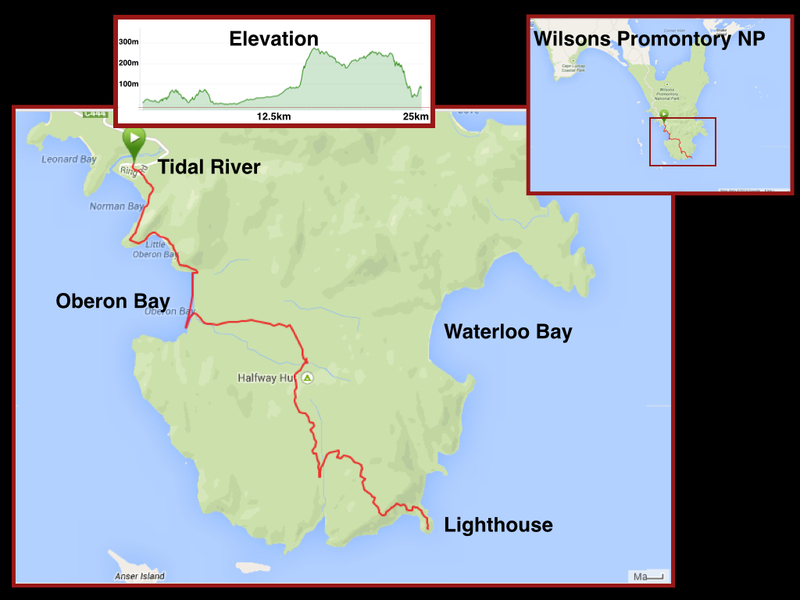 The track to Oberon Bay starts, very conveniently, between the Visitor Centre and General Store at Tidal River. Our walk started pretty wet and windy (again). After passing behind Norman Beach, the rain eased up slightly and our cameras saw some more action as we walked around Normal Point to Little Oberon Bay. Little Oberon Bay is stunning. Of all the beaches we saw and of the four we walked on, Little Oberon was by fast the loveliest. 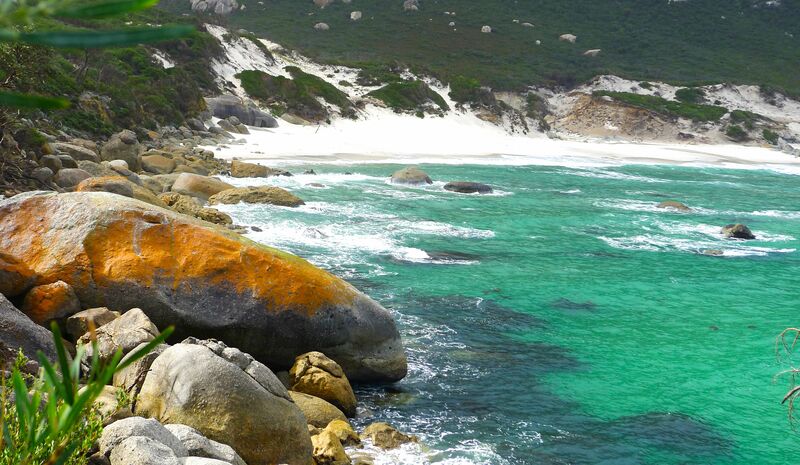 White silicon sand, turquoise water, orange rocks, green shrubs – gorgeous! The only downside is that the beach is pretty steep, so I don’t know that it would be a patrolled beach in summer; if not, I wouldn’t recommend swimming there. Continuing on around the next corner is Oberon Bay. A much longer, less sheltered bay, with yellow sand. Not quite as picturesque, but a much shallower beach and better for swimming – not that I had any desire for a dip; I’d prefer not to experience hyperthermia which was what the wind was promising! If you cross Growler Creek and continue on down Oberon Bay there’s another camping area. While not deep, I still found the best way of crossing the ‘creek’ (it is still a creek at when it meets the ocean?) 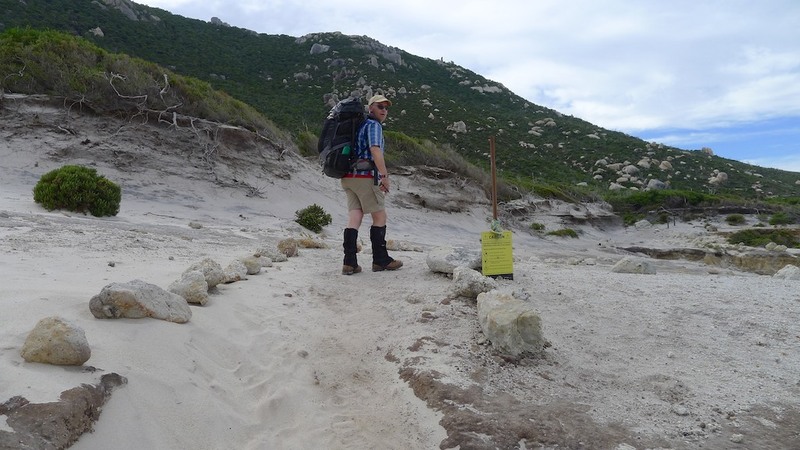 while getting the least wet – yes, despite wearing hiking boots and gaiters, I still wanted to avoid getting overly wet with salty water. We lunched by Growler Creek after passing another couple coming back – the only two other people we saw along this walk. Like so many people we see out walking, they weren’t carrying anything. 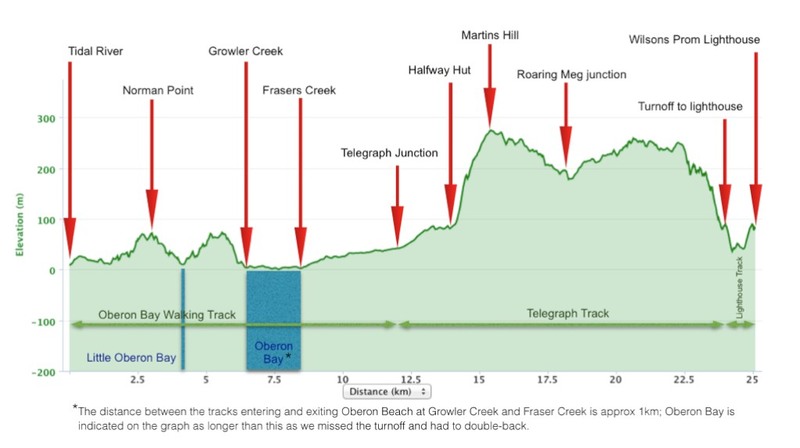 From Growler Creek it’s over 6km back to Tidal River – that’s 12km+ they’ve come without even water – that’s pretty silly. Water is the primary reason why Stephen and I each wear a backpack, even though we sometimes may not drink more than a quarter of what we take. 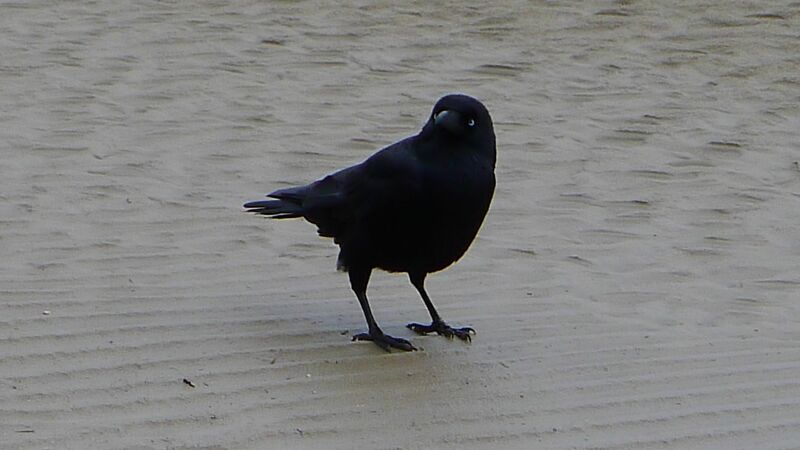 Today we were joined for lunch by a hopeful raven (most likely Corvus coronoides), but it got no satisfaction from us. Despite the weather looking like it was closing in again, we were spared too much more rain on the walk back. We took the short path out to Norman Point, but the sun was not in the best position to get great photos. 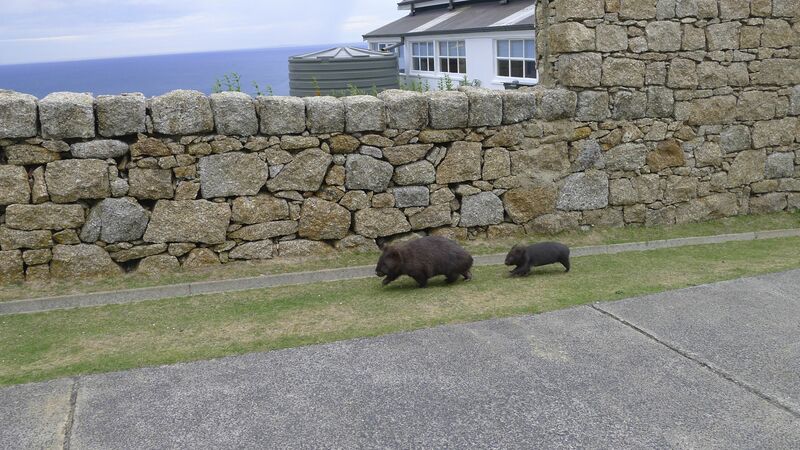 Walking back to the car parked near the Visitor Centre, we saw many wombats! Wombats clock on from 3:30pm it seems. And there was a nice kookaburra, too. We arrived back at the General Store at 3:45pm ready for a post walk icecream! Just in time, too – despite the sign saying they close at 4pm, they locked the door to all comers at 3:50 – not a minute after Stephen went in. The next three people who turned up were a bit confused and disappointed! Fortunately they seemed to know people who were already in the shop buying things. Too bad if not! I wonder if this ‘hospitality’ is the same during the peak summer months? 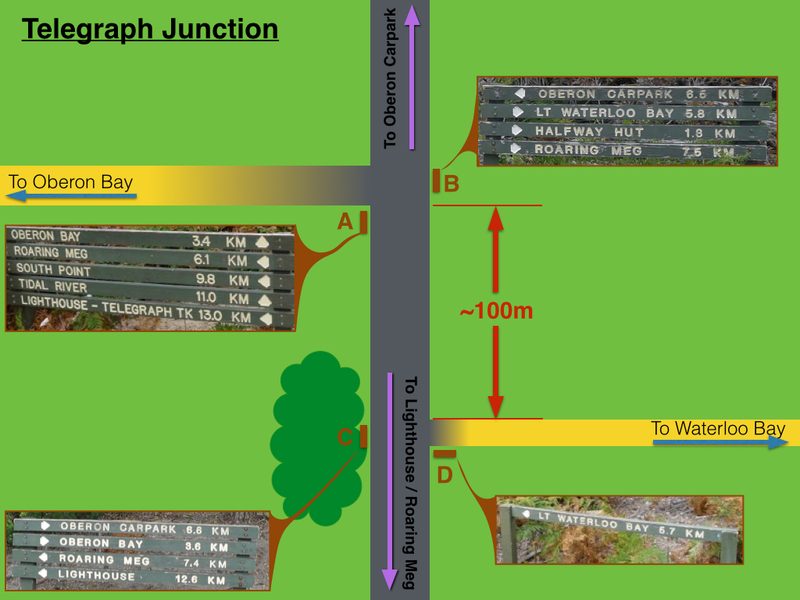 Here are the map and stats from the Oberon Bay walk. This is from Stephen’s garmin because I didn’t reset mine between walks, and so recorded not just both walks we did today, but the drive back to the cottage afterwards. A lesson for next time. So it wasn’t until about 4:30pm that we headed up to the Telegraph Saddle (Mt Oberon) carpark to then walk up to the summit of Mt Oberon to take sunset photos – arguably the most iconic photos taken of the park, possibly along with the orange stained rocks of the beaches and Tidal River. Being winter, we realised that we didn’t have much time to waste getting up there. 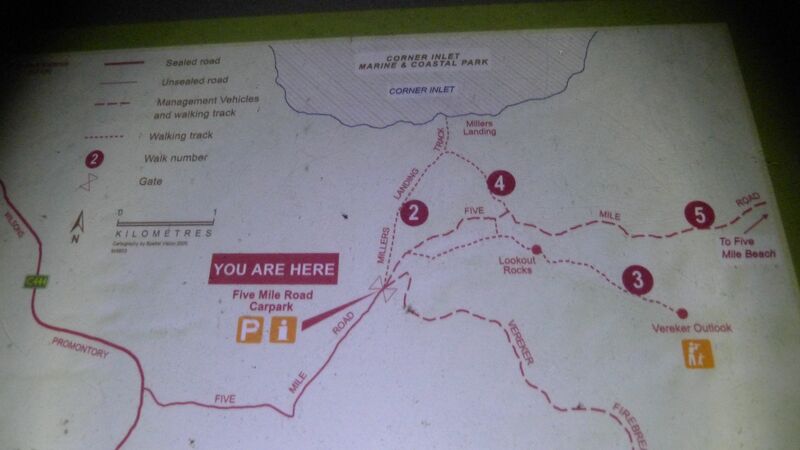 The sign at the carpark says the road is 3.4km; the walk notes on our map said 6.5km return and to allow 2hrs. With sunset just after 5:30, it sounded like we might be cutting it fine! So, after one photo at the start to the road, the camera went back into my pocket; time to focus on walking. Steel springs! It was a quick march the whole way. I arrived at the top of the road in 45min; hot and red-face – but before the sun had set! From the top of the road, there’s one last one effort to make it up to the actual peak – some stairs and steps carved into the rocks behind the transmission towers. This last little effort is a little bit like an easier version of the very top section of Mt Warning in northern New South Wales when you get to the chain section. You think you’re done, then there’s just a wee bit more before you get to the lookout! 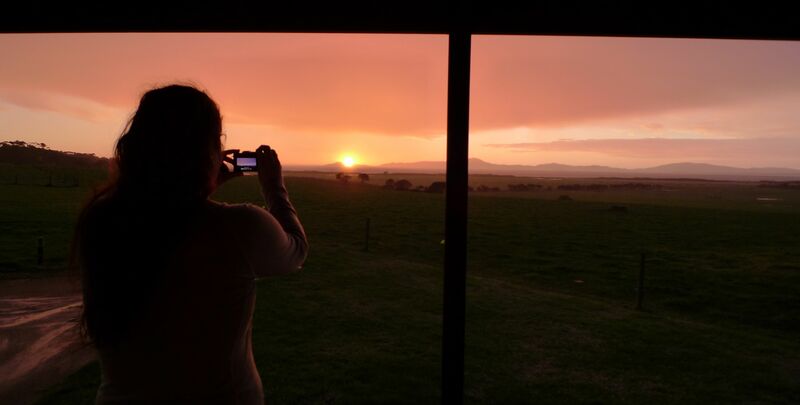 But then you are rewarded with an amazing 360 degree view over the park and Bass Strait and of the setting sun. What a view! We weren’t the only ones up there. There was a group of half a dozen asian (Japanese?) students who were jumping around as though they were getting a bit cold. Funny that. Fortunately it wasn’t blowing a gale – given the weather of the last couple of days (including gale force winds up to 113km/hr) we were supremely lucky to have such perfect weather. Don’t rush; don’t want to break a leg. The light of a shining half moon helped guide us the down the road back to the car. Here are the map and stats from Stephen’s walk up to the summit. I’m rather disappointed mine aren’t so easily decipherable – here it is incase you want to have a look for yourself. It was a slow drive back to Black Cockatoo Cottages – maximum speed was only about 60km/hr due to the abundant wildlife. The majority of the wallabies and wombats we saw were happy to keep munching by the side of the road, or turned away as we neared, but a couple of wallabies had different ideas and wanted to cross in front of us. And then there were the deer. Sambar, to be precise. 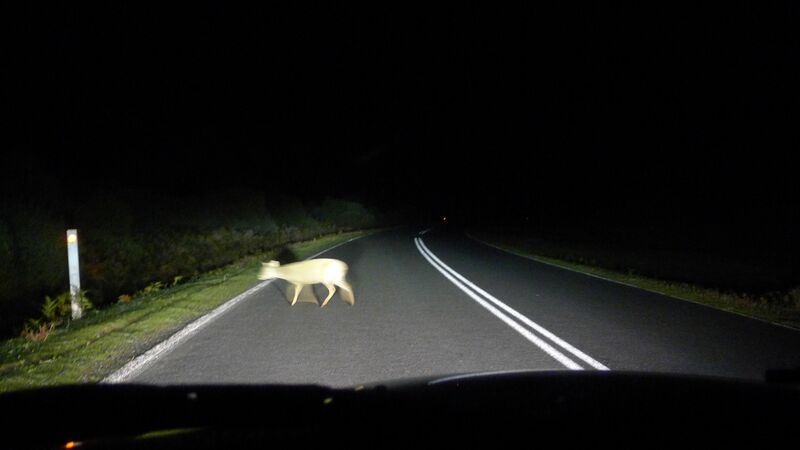 Despite the wallabies, wombats, kangaroos, emus, possum, deer, rabbits/hares, and an unidentified bird that wanted to swoop across the road just as we were driving by, we made it home without killing anything. Bit of a relief, really. Fantastic sunrise this morning – and given it was my last opportunity to photograph it, what more inspiration did I need? I grabbed the tripod and got going. Looks like a nice day ahead – pity we’re leaving! I had no idea what the time was, but I’d taken a couple of photos when I heard the dairy farmer next door start his day, so… early enough. The only drawback with having such a magnificent view from you bed is seeing what you’ll miss if you close your eyes. Pity I couldn’t take these photos from bed! But it wasn’t quite as cold as previous mornings – still cold enough, but again being out of any wind or breeze makes it much better. I believe that the mark of a really good holiday is that as you leave you’re already asking yourself ‘When can I/we come back?’. So, would we go back? 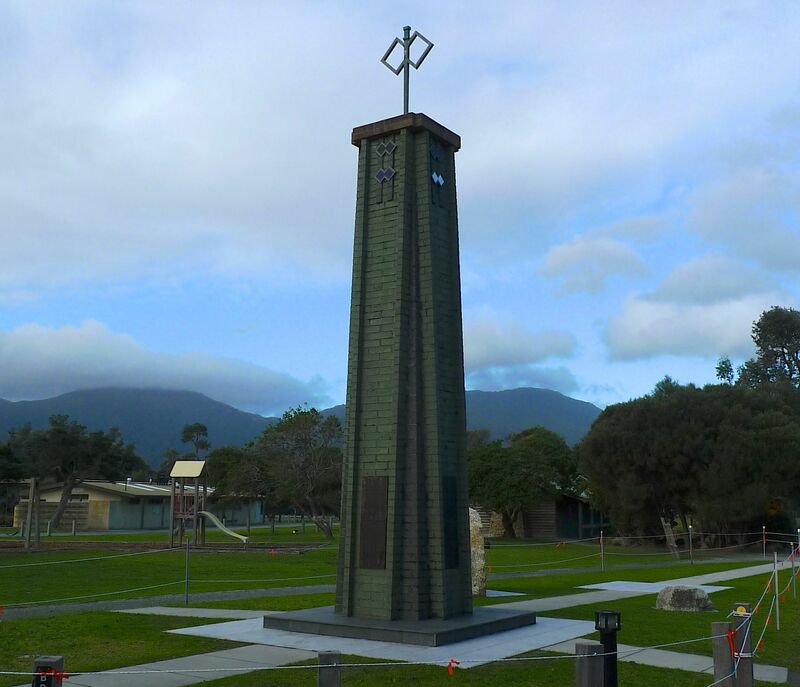 Wilsons Promontory National Park is spectacular and beautiful and deserves all the lovely things that are written about it, but (and there’s a BUT)… there’s a lack of adequate services within a reasonable distance of the park. Basic accommodation and scenery are not all that tourists looking for in a holiday destination. At the moment I really feel that’s all that is on offer if you want to stay somewhere in or close to the national park. Since visiting the park currently requires you to take your own food supplies with you, it’s good to know in advance where you can buy supplies should you run out, or if you’ve forgotten a key ingredient – or your toothbrush! There are also no take away food options for dinner after Foster. I don’t know what the cafe may provide in the summer peak – maybe fish & chips? Though by the look of it don’t expect restaurant quality dishes. In low season the cafe closed for the day even before the General Store did. Should you arrive at your destination and find yourself low on fuel, you can apparently refuel in Yanakie (just on the Park boundary). We made it back to a BP service station in Leongatha to refuel. There has been – and still is – a lot of resistance from various groups to the thought of opening up our national parks to commercial development. 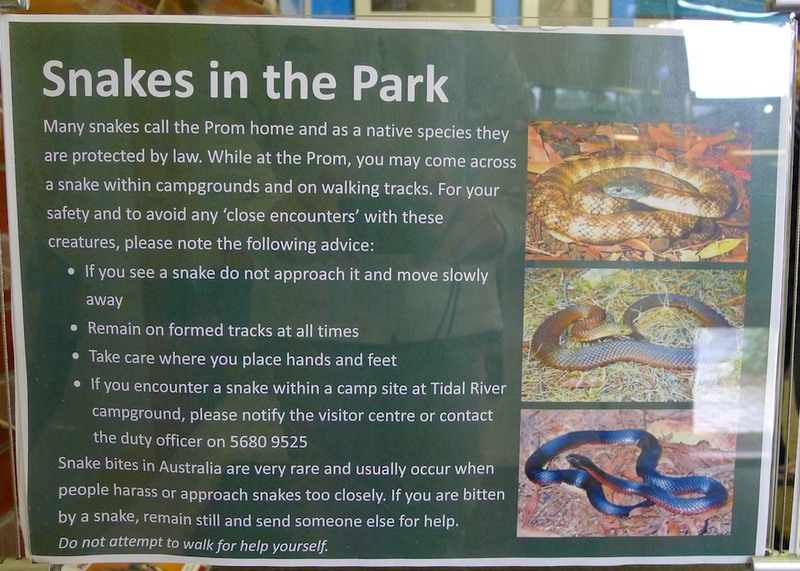 Victorian National Parks Association (an NGO – not Parks Victoria) are totally against it. Friends of The Prom (FOTP) are organising a rally in November to show their protest against the idea. “Hands off” is their key message. While these groups do a lot of good in raise awareness about national park issues, and the FOTP have certainly done much to help the park recover from recently natural disasters, it does seem that people are assuming the worst about any potential commercial development (i.e. that their beloved parks are going to be trashed by thoughtless, rich interlopers attracted by large hotel chains who are only out to make money from what doesn’t belong to them). However, with the construction a few small private huts just off existing tracks (as is the case along the Overland Track), walkers like Stephen and I would have the opportunity to see more of the park than is currently within our reach. Small groups (8-10 guests) of guided walkers are not going to trash the park. At an all-inclusive cost of $400-600pp/night (based on 2013/14 season prices charged by the private operators of the guided walks along the Milford and Overland Tracks), this kind of experience attracts people who really want to experience and appreciate the best our premium national parks have to offer, and who don’t care to (or can’t) do the camping option. Remember, it’s not just Victorians and 20-something backpackers who want visit. The desire to see the worlds best National Parks is experienced by everyone at some point who has been touched by the beauty of nature. If you were travelling from interstate or overseas and were told to bring all your food for the duration of your stay with you – how would you manage? One of the pioneers of national parks in Australia was Gustav Weindorfer in Tasmania, who was instrumental in the formation of the Cradle Mountain – Lake St Clair National Park. He didn’t just want to protect this place of great beauty and environmental significance, but share it with people. The (and his wife Kate) built a lodge and brought in guests. They didn’t try to hide their find. They understood that the more people who visit and fall in love with a place, the greater the number of people who will then be willing to protect that place, and places like it. Shared BBQ (electric) area. BBQ (electric) on veranda. If/ when we go back, we plan to walk to the Lighthouse and stay a night or two (there’s no minimum stay, but maximum stay is 2 nights – yep, go figure), but otherwise we’d be staying outside the park at in the studio cottage at Black Cockatoo. (I can’t pass up that view!) By ourselves there’s no way we’re going to get to see much of the rest of the park that you can’t do as a return day walk. Categories: Holiday, Victoria | Tags: beach, Black Cockatoo Cottages, bushwalk, daywalk, Gippsland, Hiking, Mt Oberon, Norman Beach, Oberon Bay, Parks Victoria, photography, Sunrise, sunset, The Prom, Tidal River, Victoria, Wilsons Prom, Wilsons Promontory National Park, wombat, Yanakie | Permalink. 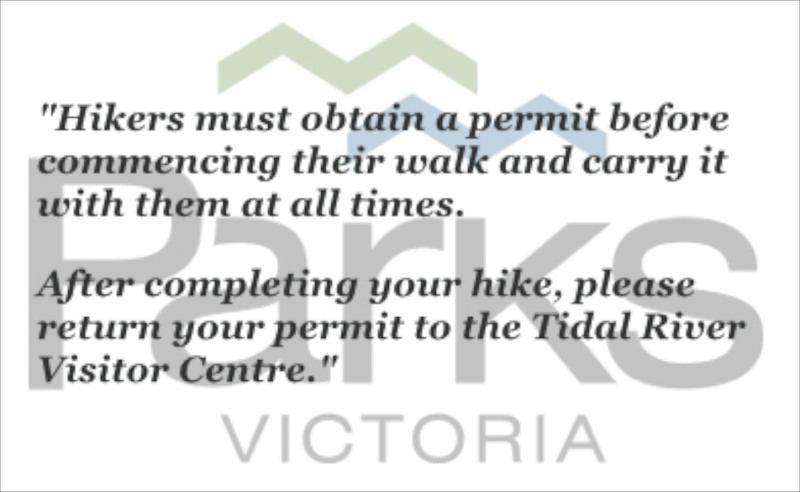 Parks Victoria declares that “The Prom is one of Victoria’s most-loved places“. 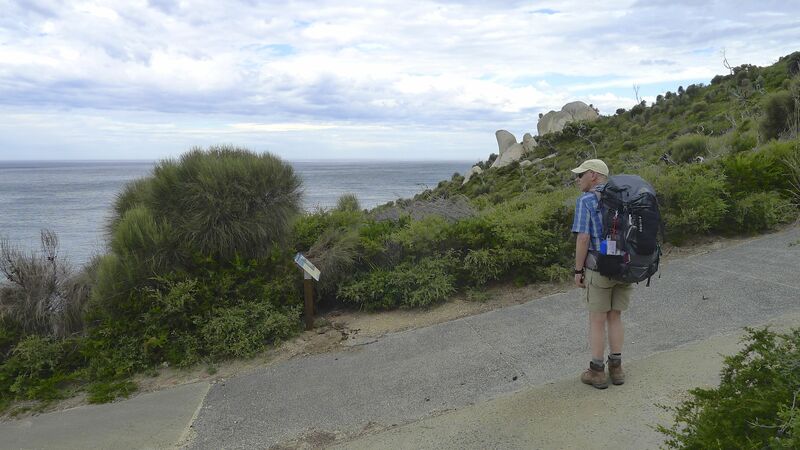 Indeed, most people who know our love of a good walk in scenic locations had been very surprised to hear that we’d never been to Wilsons Promontory before. The reason for the delay has been the lack of accommodation options and general services available to visitors to the park. Unless you’re prepared to camp, the in-park choices are costly &/or unappealing to us for a variety of reasons, which is why we chose to stay at Black Cockatoo Cottages just outside the National Park. Wilsons Prom is a roughly 3 hour drive south-east from Melbourne, and the road there via Korumburra and Leongatha has much to recommend it. I love a windy road through the hills! 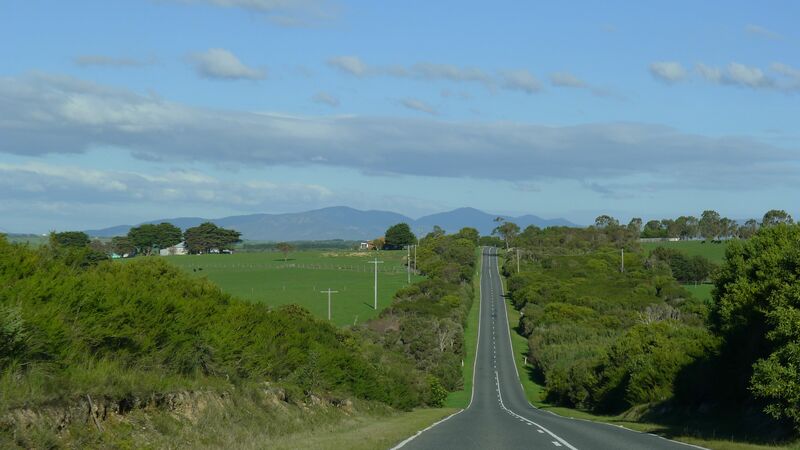 Gippsland is very green – they get a lot of rain around there – and you pass through mostly dairy farms on the way, but there are also some beef cows and sheep grazing contentedly in the fields. We stopped briefly at a winery just before Leongatha called Clare de Lune and met Brian, the winemaker, who used to be an abalone fisherman in Waratah Bay, which is the bay to the west of Wilsons Promontory between it and Cape Liptrap. I liked his 2013 Duo (Sauvignon Blanc/Chardonnay) and was intrigued by his quince liqueur. We bought a couple of bottles of red and white and kept going. (On the drive home we bought a bottle of Djinta Djinta 2008 Merlot, the vineyard next door to Clair de Lune, which was really good, and a bottle of Lucinda Estate 2012 Chardonnay (fine & dry) which was also quite lovely and refreshing). With wine, of course, you need cheese (and vise versa). When Stephen asked, Brian advised that Berry Creek Cheese doesn’t sell direct from the factory anymore, but the IGA in Leongatha stock their cheeses. So we made another stop and were very pleasantly surprised by Leongatha’s IGA! Our hosts at Black Cockatoo had also advised us to ensure that we buy food for our stay at Leongatha before coming down to the Prom. We had done all our essential shopping before leaving Melbourne, but stopped for some local cheese. I’m not a huge fan of blue cheese, but we tried both the Mossvale and Tarwin (2 of Berry Creek’s 6 blue cheeses), and we both preferred the Mossvale Blue. 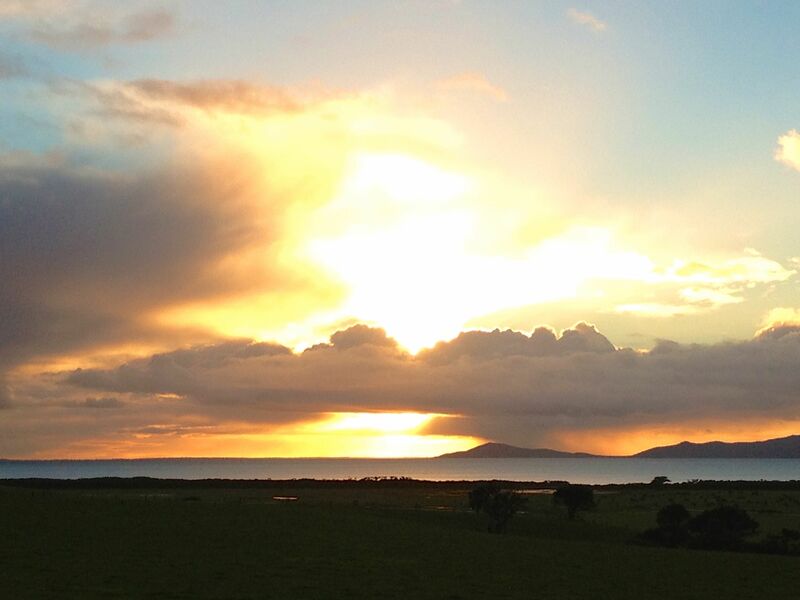 Just out of Leongatha you get your first view as you come down from the hills, across the farms to the Prom. Wow! I had no idea it was that big! The hills look like mountains as they rise up from the sea, and there are a lot more of them than I’d realised. But just because you can see something doesn’t mean you’re all that close, and it was still over 30min before we had found the turn off to our accommodation, a couple of kilometres outside the park. One of a few accommodation options just outside the park, Black Cockatoo Cottages is protected from the enthusiastic westerly and northerly winds by the tall pines and gum trees at the front of the property, and the other dense trees along the fence lines creating windbreaks. The way the cottages are positioned just below the crest of the hill helps, too. All the cottages on the property face the east to take advantage of the view, but we were especially lucky to get the studio cottage at the end of the property, because that cottage’s floor plan has the bed facing out to the view – possibly the best part of staying there. The colours of sunset were good, but the sunrises were amazing! It did mean I didn’t sleep in at all, though… the thought of what I’d be missing out on if I closed my eyes was unbearable. The cottages are surrounded by paddocks belonging to a dairy farm – a New Zealand dairy operation that is owned by Germans (according to our hosts), which supplies Devondale (per the sign on the gate). Make of that what you will. That meant that twice a day we were entertained (no, it doesn’t take much) by watching the cows meander back to their assigned field after milking. There’s no herding; they know the routine and just do it. Our only disappointment was that, over the duration of our stay, they weren’t put in the paddock right next to our cottage. I don’t often get the chance to wake up to cows. 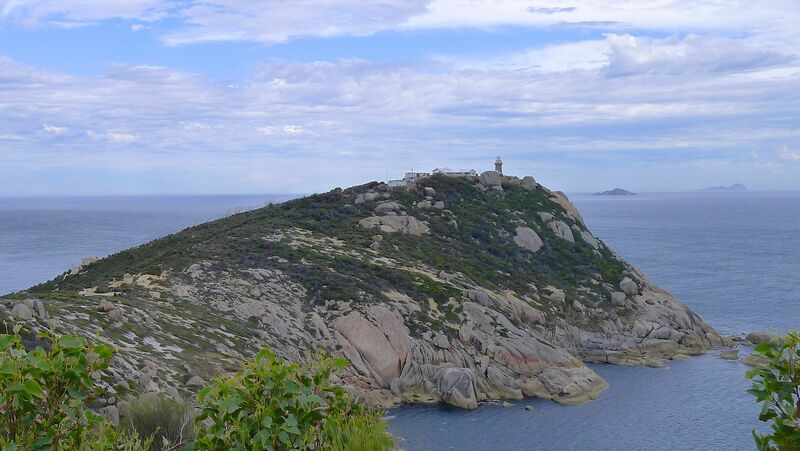 Wilsons Promontory was once part of the tribal lands of the Brataualung. In the 1800’s, sealing, whaling and logging were industries carried out on the promontory. By the turn of the 20th century it was the pastoralists turn, despite the general poor quality of the coastal grasses. 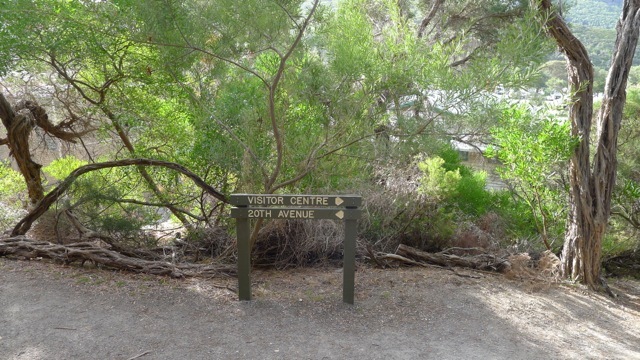 In response to a government proposal to create a settlement at Waterloo Bay, the Field Naturalists Club of Victoria (FNCV) led the campaign which eventually saw the formation of Victoria’s first national park. The role of national parks, namely being for the “preservation and protection of native fauna and flora” was shunted to the side somewhat when the army used the Prom as a training base for commandos during WWII, and to monitor Bass Strait. The toll on the park was such that the FNCV found it required considerable rehabilitation afterwards. 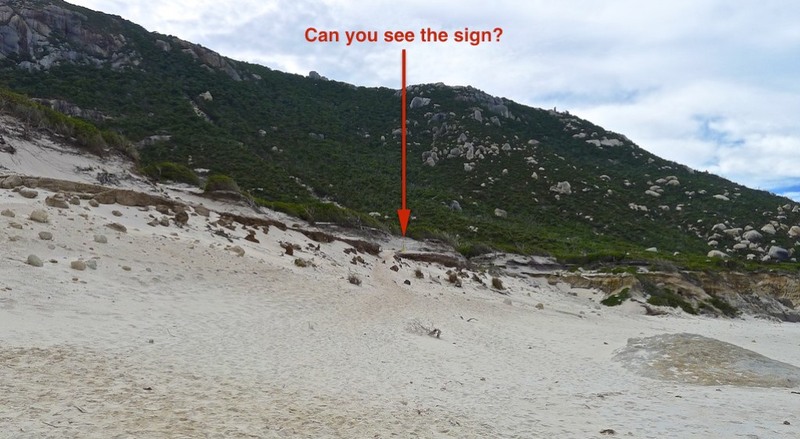 Wilsons Promontory has made headlines in more recent history when in 2005 what was to be a controlled burn got out of control and 13% of the park was burnt. A lightning-sparked blaze in 2009 burnt out much of the top half of the park. 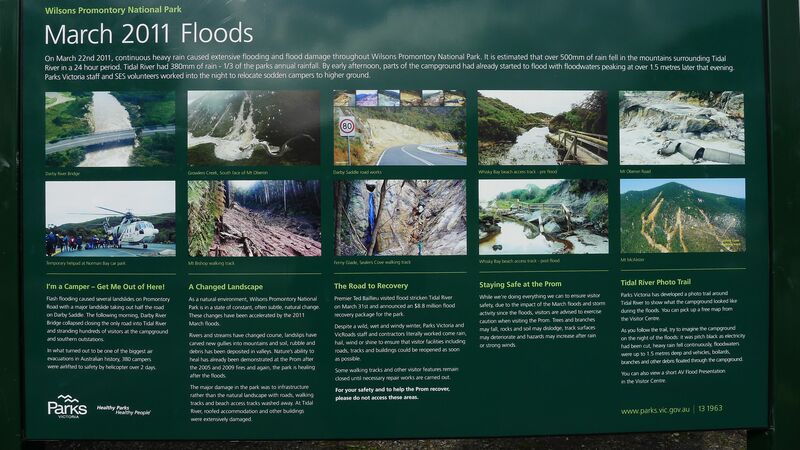 Then in 2011, extremely heavy rainfall caused landslides and flash flooding, leading to the only road in/out of the park being cut and people had to be evacuated by helicopter. The tracks that were damaged by landslides have only just been reopened to the public after an enormous amount of effort has gone in to repairing them and making sure the environment is as safe as can be expected. It was a clear-ish sky this morning so I took the opportunity to take some early morning photos. My reward for being up early was seeing the International Space Station (ISS) go over at 6:17am-ish, and dawn sometime after that. The lovely morning turned into a rainy day. We knew it was going to be windy even before the rain came because we could hear it in the trees around the property. Knowing we wouldn’t be walking, we headed off anyway to see what the drive to Tidal River (the only settlement in the park) was like. We didn’t see anyone else going into the park, but passed a few people coming out (winter being low season, after all) so it only took about 20min or so to drive the (roughly) 30km to Tidal River. There are aspects of the drive that remind me of a number of locations, but of all the places I’ve been it bares the strongest resemblance to Freycinet National Park in Tasmania – only the mountains here are higher, more vegetated, and the granite is not pink. 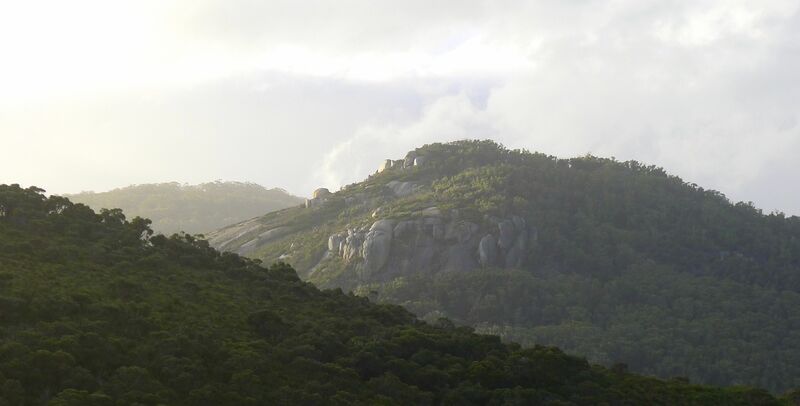 You pass through steep shrubby dunes, swampy plains, and over tall hills/low mountains that look like the smooth, bare granite boulders are both bursting out of them and extras have been scattered over them as an afterthought. The road signs warning of wildlife are very busy. There aren’t many showing just one animal. There are some with up to 4 animals on the one sign! Winding road – and a bird? Hang on – wild people? Passing Squeaky Beach I commented that there wouldn’t be any squeaks today. 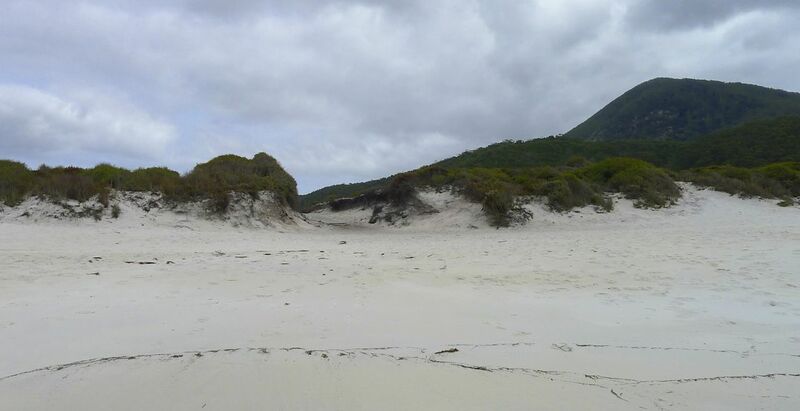 You know, I had a few people tell me to definitely visit Squeaky Beach. Maybe that’s why Victorians like going to the Gold Coast so much! It’s warmer than Melbourne and they can find squeaky sand! If the weather co-operates we may have to give it a go – just to see if it squeaks as good as Queensland sand, of course! 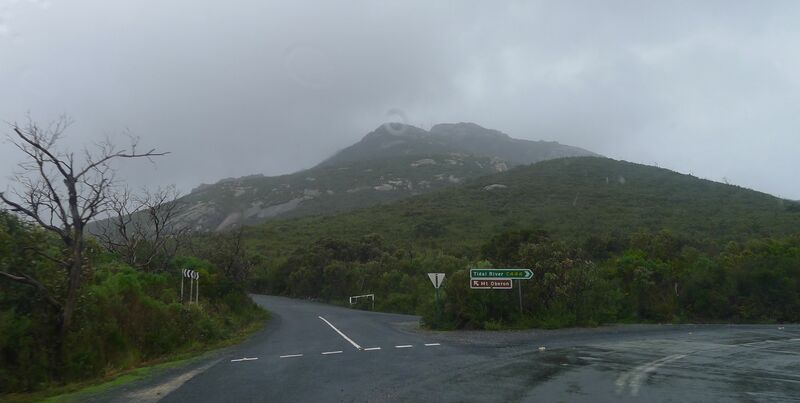 We had initially thought to climb Mt Oberon today – the weather put paid to that idea. The weather report on tonight’s news said wind gusts down here at the Prom reached up to 109km/hr! 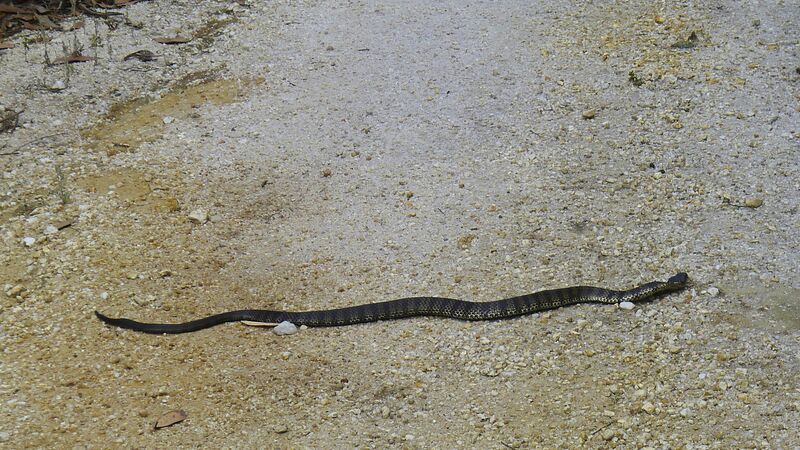 I took a photo of it from the Visitor Centre at Tidal River instead. There’s not that much in the Visitor Centre. An information board said the track across to Sealers Cove had been re-opened which was good news, and there was general park information, a weather forecast, and free-but-not-very-detailed-maps but at least there was something. The staff there really just seem to be administration people to take bookings, collect fees and issue permits to campers and overnight/multiday hikers. Next to the Visitor Centre is a General Store which has a souvenir shop. You can buy a giant stuffed (toy) kangaroo there for $500.00! It would have stood about 2m tall. How you’d fit that in the boot of a car (along with the rest of your camping gear) I have no idea. I bought a couple of (nice but overpriced) postcards and we headed back to the cottage. There’s also a cafe attached to the General Store which possibly sells food in summer. I may well be mistaken, as I was in there for a whole of maybe 10sec, but I don’t think they actually make anything, just reheat stuff. Whale bone outside Visitor Centre – wow that’s big! On the way out of the park we saw a kangaroo, a wallaby and a wombat – fortunately all alive and munching away contentedly on the road shoulder. Later in the afternoon when it appeared the showers might be easing slightly, Stephen suggested we go and see if we can see more animals along the road our host suggested. We layered up, grabbed torches and headed back into the park. 14km into the park is Five Mile Road which, according to our hosts, is supposed to be great for seeing animals along. Although it’s unsealed, it’s pretty well maintained. The surface is a fine gravel that drains well, so there wasn’t any flooding or even puddles on the road despite the heavy rain during the day. 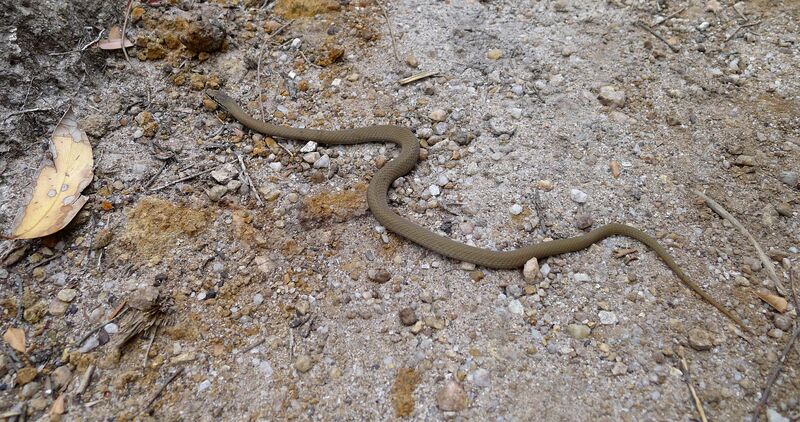 We drove to the carpark a couple of kilometres in – without seeing any animals – and decided to walk further along the track. 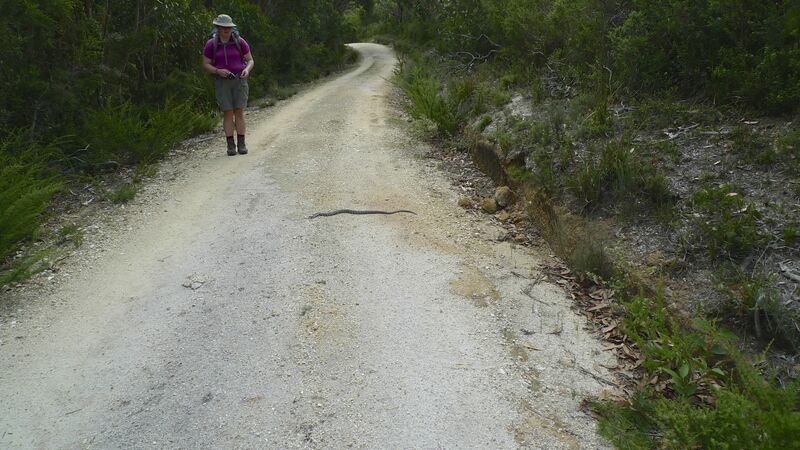 A number of tracks start at the carpark, but we thought the one straight ahead would be our best bet. 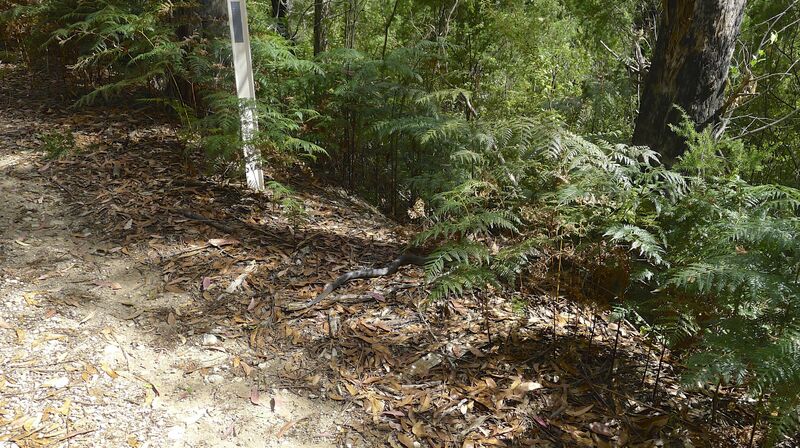 We walked a steady uphill gradient for a while along the wide vehicle track passing through banksia forest with an understorey of grasstrees and brackenfern, but did we see anything? Nope. Not a foot print or dropping. To be fair, given the recent rain I would have been mildly surprise to have seen tracks if we didn’t also see the animal that made them, because anything older would surely have been washed away. Something other than a banksia! At the top of the rise (at about 1.5km along) we came to a couple of signs. 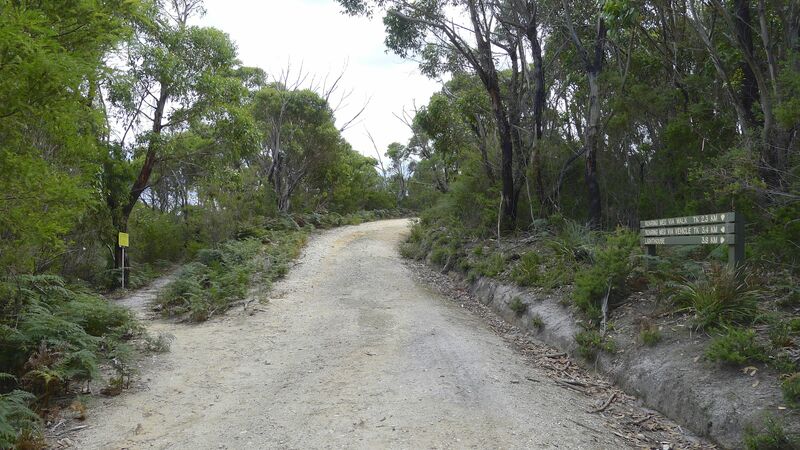 One small path lead up to a lookout, the other was a rough vehicle track leading down to the bay. By this stage it was close to sunset, and Stephen argued that it would be better to go down on the clearer track rather than up the more indistinct track and risk getting lost, despite carrying torches. So down we went. As soon as we turned off the main road, there were wombat scats every few metres it seemed! We still didn’t see any animals though. 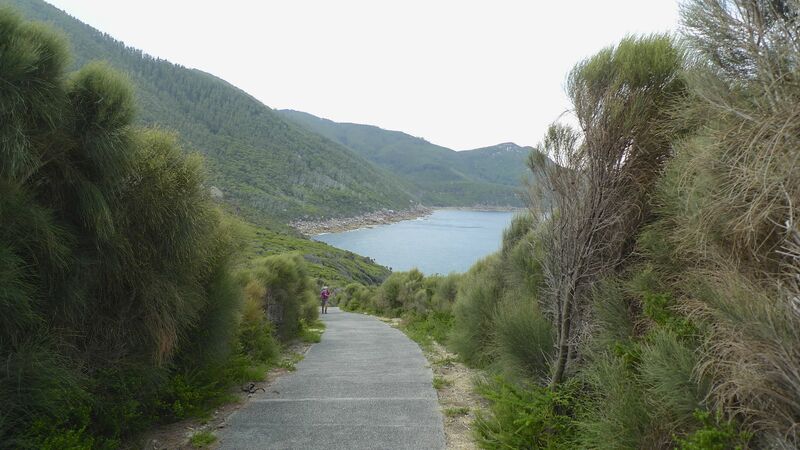 1km down the hill, the track ends as it intersects with a nicely made gravel footpath (which turned out to be Millers Cove Track) which was somewhat reassuring – if only because it meant we didn’t have to return up the sandy track. After a final, slightly steep descent to a sliver of a beach, we’d reached the bay with just enough light to take some photos and record some frog calls, then turn to head back to the car. 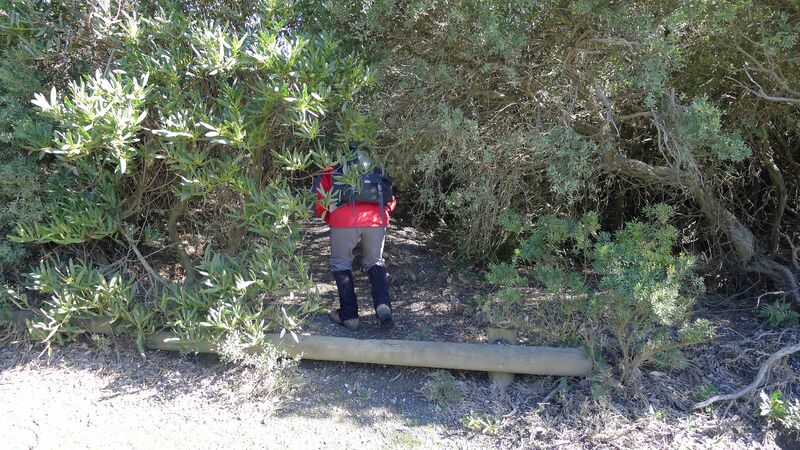 I was pretty sure Millers Cove Track lead back to the carpark…. Happily we didn’t have to. Only a hundred or so metres (give or take) later and we emerged back at the car park. It’s good to remember that when you’re unfamiliar with a path, and especially in the (semi)dark, distances seem to multiply. From the carpark to the beach it’s only 2km. Not knowing this, and not being able to see clear reference points, made it seem double that distance – even thought my feet knew we hadn’t been walking that far, my head was starting to get wild ideas. 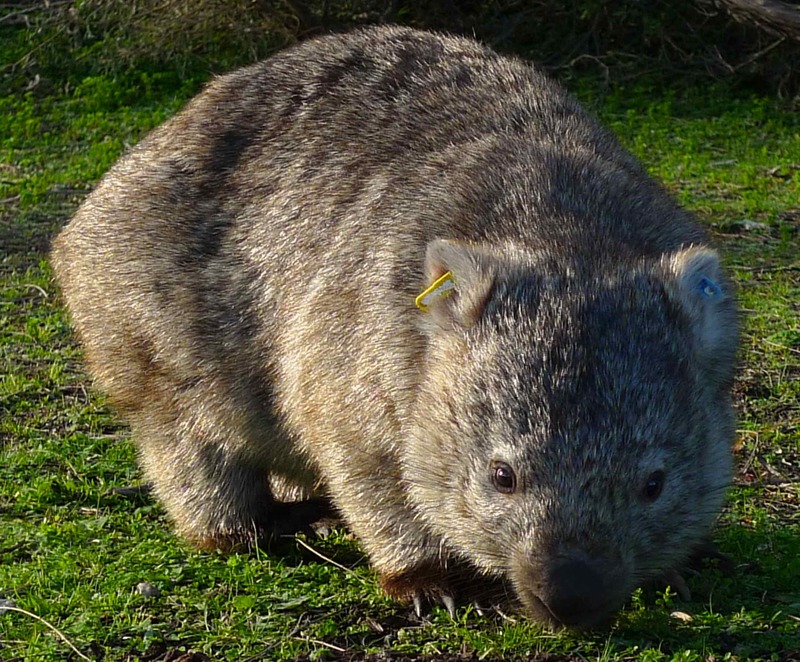 We saw a wombat on the way out that I tried to photograph but couldn’t quiet get his happy face in view, and a couple of rabbit on the road. Aside from another 3 wombats by the roadside, that’s all we saw. So much for a wildlife hotspot. Maybe the animals had the night off. We woke to the sound of rain on the roof. 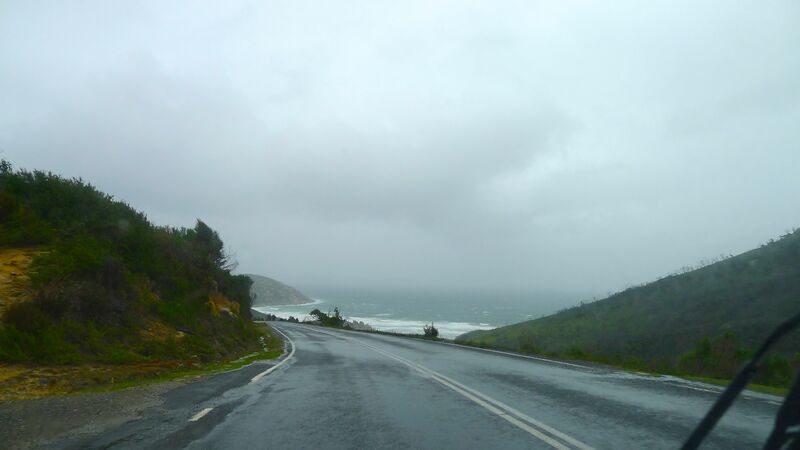 (The news reported 43mm for Wilson’s Prom). The sunrise wasn’t quite as clear and spectacular as the previous morning, but there were moments of beauty that I photographed. 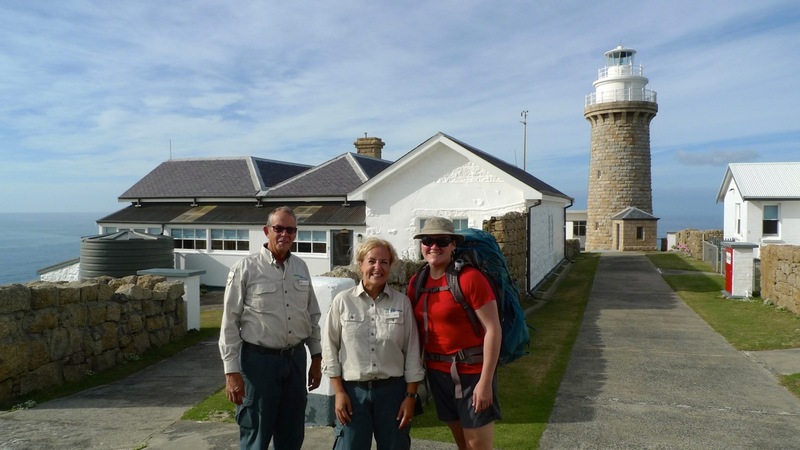 Unlike the previous day, the weather did seem to be clearing instead of closing in, so we decided to go around to Cape Liptrap Lighthouse and try to do part of the Cape Liptrap Coast Walk. 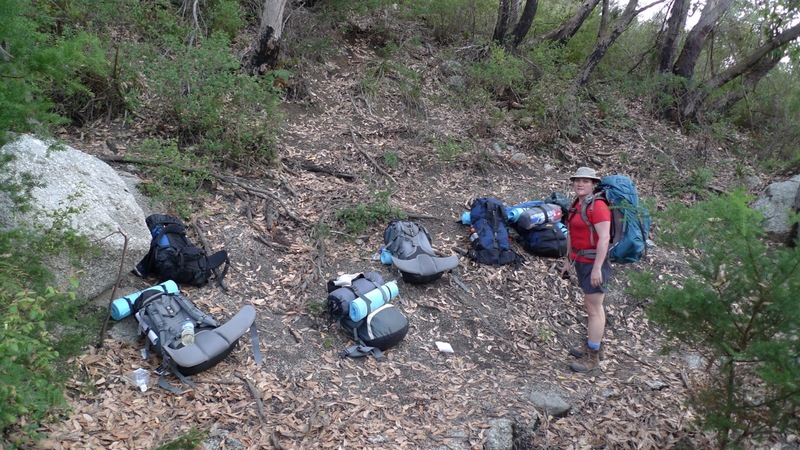 Armed with a map (to find our way back up the road to Fish Creek, and then down the other side of Waratah Bay to Cape Liptrap), a walking book (Day Walks Around Victoria), our GPS, and full walking attire, we set out. It’s a very nice drive, on winding, tree-lined country roads through the rolling green hills, between dairy properties for the most part, but there are also some sheep in the paddocks we passed, too. After a couple of false turns along the way – the map we were using wasn’t terribly detailed – probably should have just used google maps on one of our phones since we’re with Telstra and have coverage – we eventually made it. If we drove there directly, from just outside the park I think it would have taken about 1hr or close enough. The last part of the road, shortly after the point where you see a brown sign indicating the old kilns and the lighthouse, the road is unsealed and not too bad, but could be better. The potholes for the most part are in the centre of the road and can be avoided by driving in the middle of the road. Even so, there was one or two that were a surprise. No lasting damage, we hope. There are private properties all along the length of the road until you get to the lighthouse. All I can say is these sheep and cows must be accustomed to really windy weather and fabulous views! As soon as we got out of the car we donned our gortex jackets, hiking boots, gaiters, beanies, and gloves. From the carpark it’s a 2min stroll to the lighthouse. As I walked along I reflected at how, if we were up at the snow, I wouldn’t be wearing all that much more than what I was at that point. Another layer top and bottom perhaps. Thicker beanie and snow gloves. Water proof pants. That’s about it. The wind hadn’t died down must – if at all – from yesterday, and the chill factor was notable. The risk-of-being-blown-away factor was also notable. 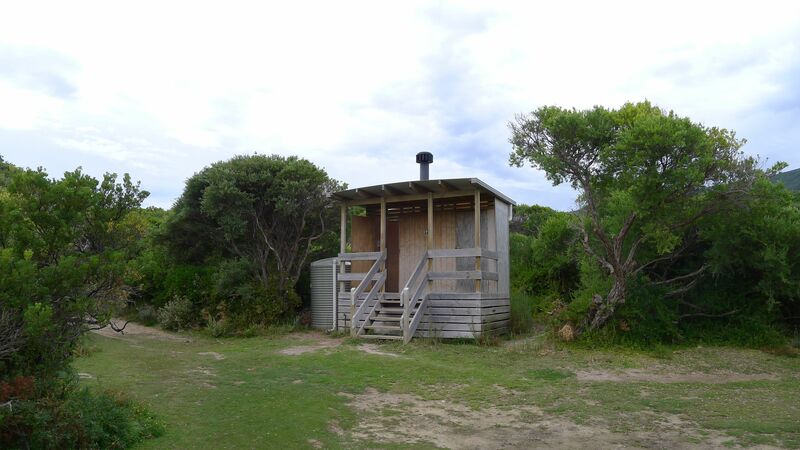 Cape Liptrap Lighthouse is not particularly ostentatious. It’s not very tall, nor does it have stripes of any kind. Just square-sided, white and adequate for it’s purpose. You can’t even see it from the carpark, and you only get a glimpse of the top of it from a couple of hundred metres back up the road. There was one other person there when we arrived: a Bloke. In his jeans, boots and checkered jumper, you didn’t have to ask if he was cold because every ounce of him was silently, but staunchly, declaring that he was Not Cold. Compared to him, we looked like we were about to set off to Antarctica! Photographs taken, we walked back past the carpark and along the road a bit, following Glenn Tempest’s directions. At least, we thought so. After walking up and back along the road, venturing along the path hang gliders launch from, re-reading the instructions – all the while both of us missing the key word/instruction “disregard [this path]”. What track? Stephen resorts to GPS unit. After trying various means of trying to determine where the track started, Stephen found a track on his GPS unit which looked promising. It started roughly 100m up the road from the ‘false’ track we were on and, as I look over the trail notes once again (now that we’re back at the cottage), actually matches the instructions given by Glenn Tempest. Having wasted about 45min searching in the wrong place for a track that isn’t there, we moved up the road and got it right. It was obvious very quickly that this was the right path, despite the shrub being pretty close in parts. Finally found the correct ‘concealed’ track entrance. It’s not a maintained path – there are trees down and large puddles on the path that require a bit of negotiating. At the junction, roughly 50m in from the road, we took the left hand path that leads pretty much straight down the hillside. It’s a very rough track culminating in some serious erosion that we would call ‘precipice’ or even ‘cliff’. Unwilling to risk life and limb – and the possibility of not being able to scramble back up again – we abandoned our goal of exploring the cove and scrambled back up the slope. The woody shrubs that parted with a little bit of effort on the way down seemed more determined to catch and snag on the way up, especially on my backpack. At least it wasn’t overly muddy and slippery – it could have been worse! We can see our goal! The beach is in sight! Looking forward to exploring this! Not yet ready to call it quits, we tried the other path indicated by the GPS near the top of the hill. Wide and clear it looked very promising…right up until it just – ended. Here are the GPS data and stats from our somewhat confused and impeded walking attempt for the day. We stopped at Fish Creek on the way home. The cafe/gallery on the road (C444) in is unfortunately closed in low season. It’s a nice little town with a main street that could really use some patching or (ideally) a complete resurface. There’s a pub (of course) and what looked like a cafe or two, but we were after a general store. Fortunately Stephen spotted it, next to the hardware shop (the only shop in town clearly open for business). They must be doing renovations because of the majority of the area is partitioned off behind a large curtain, leaving about 15m2 (I’m probably being generous) for stock. We bought a local paper (great selection) and some Arnott’s Savoy biscuits (we were lucky) to go with our cheese. Verdict? The drive there is lovely, but don’t rely on Fish Creek for supplies. As it was cold we didn’t linger. Next time I’d like to go for a walk out along the spit (checking first to make sure it’s low tide!) and see if I can spot some more waterbirds. 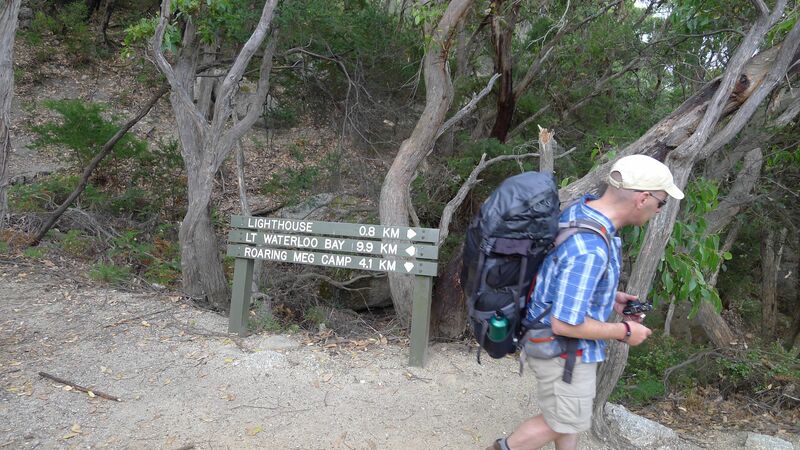 Rain, hail, or shine, we resolved that today we’d walk from the Telegraph Saddle (Oberon) Carpark to Sealers Cove. The day started clear enough. I had no idea what time it was when I woke up and saw the stars shining so brightly, but decided not to miss the chance to try a long exposure. Pity I couldn’t remember where we’d put the tripod. Nevermind. Using one of the veranda posts to steady the camera I took a 15 and 30 second shot, then used the table with the camera on a tilt for a 60sec exposure. Naturally, when I climbed back into bed, proper sleep seemed to have escaped when I opened the door. I noticed that the brightest star that I could see (from bed) was not twinkling, which means it must be a planet. I have an app that can tell me which one… I reached for my phone. 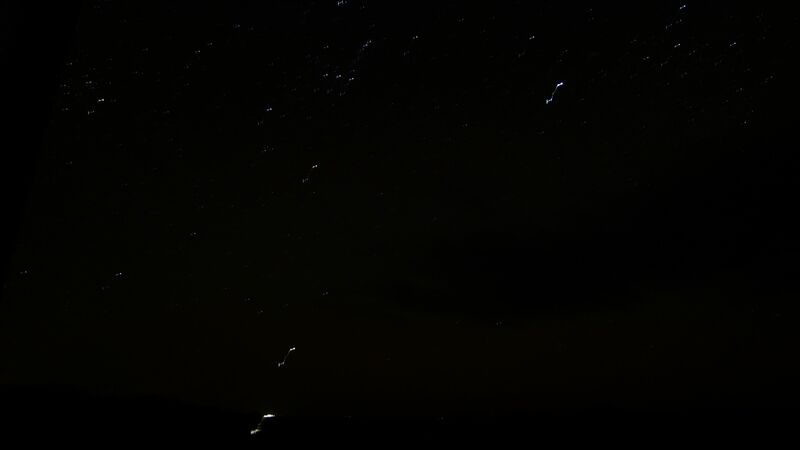 After confirming that the bright start was Jupiter and the second bright start near it was likely one of the two stars in the formation Canis Minor (Procyon or Gomesia) and that it was only just after 5:30am, I put the phone to sleep mode and tried to do the same. Passing by the ‘wildlife hotspot’ area, for once we were in luck; I spotted an emu! And some wallabies/kangaroos too, but an emu has been a much rarer sighting in our travels. 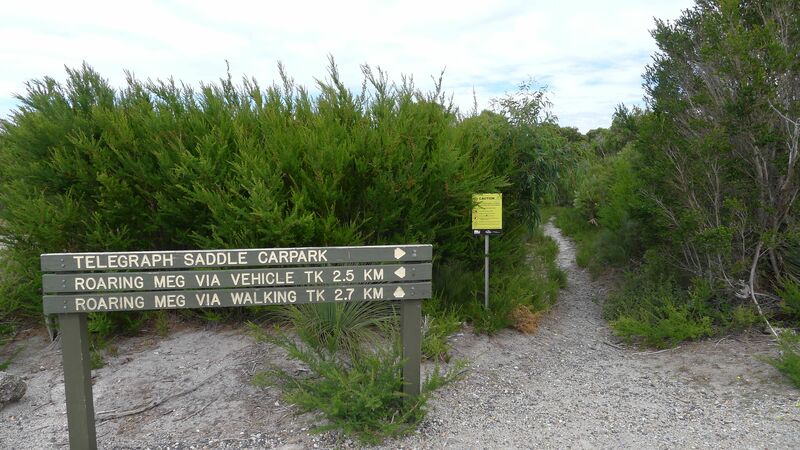 The Telegraph Saddle Carpark is 2.5km further on from Tidal River and marks the end of the road. It was pretty cold, wet and windy when we arrived. I was slightly surprised to see 4 or 5 other cars already there. It is the place to leave your car if you plan to do overnight/multiday walks, although that requires a permit from the Parks office. We were finally underway by (almost) 11am. 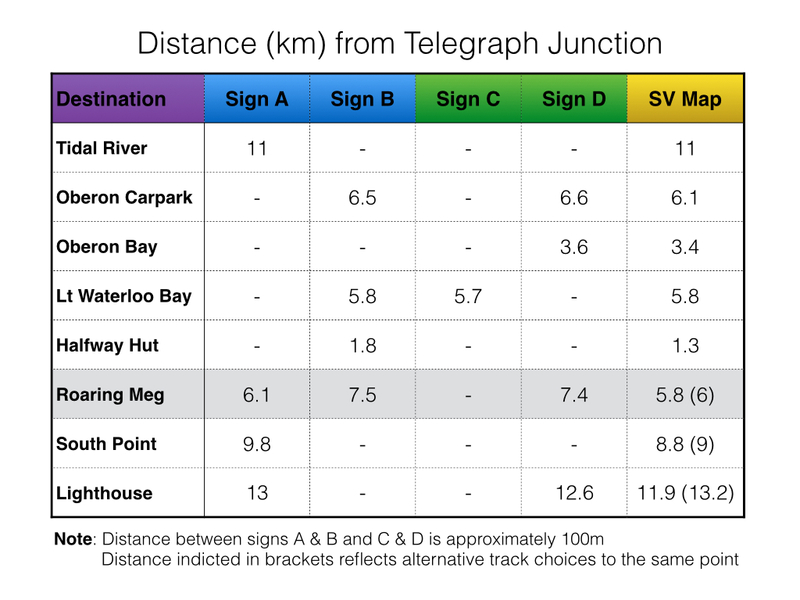 The sign at the start of the track indicated the track to Sealers Cove was 9.5km (one way) and would take 3hrs. If we wanted to get back before needing to use a torch to see by – or before a Park Ranger closed the gate at the bottom of the road (if they do close it?) on us, we’d better press on! The rain kept my camera in my pocket for the first 10-15min (unfortunately) but after that passed I was able to be my snap-happy usual self. There was a lot that was pleasing to the eye. Unfortunately, I didn’t have my camera in hand (due to another brief shower of rain) when we came to Windy Saddle. 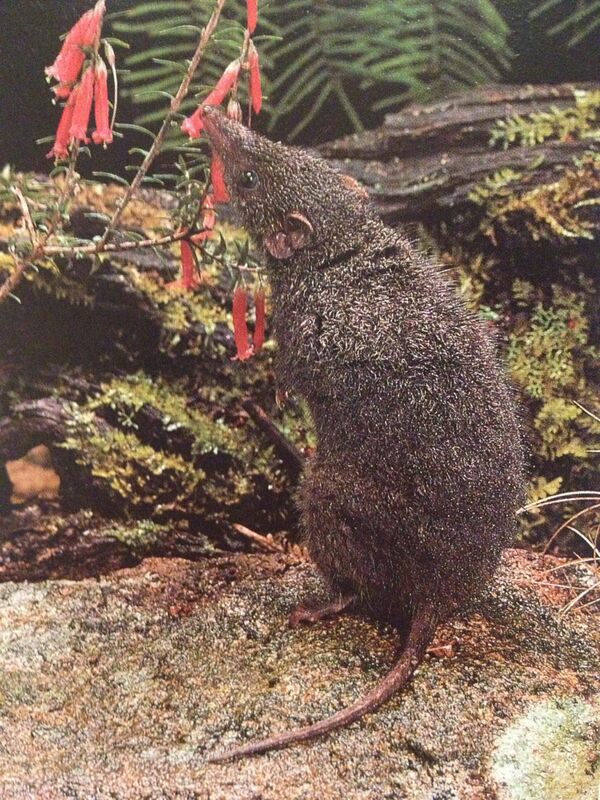 Stephen had spotted what I believe was a Dusky Antechinus (Antechinus swainsonii). 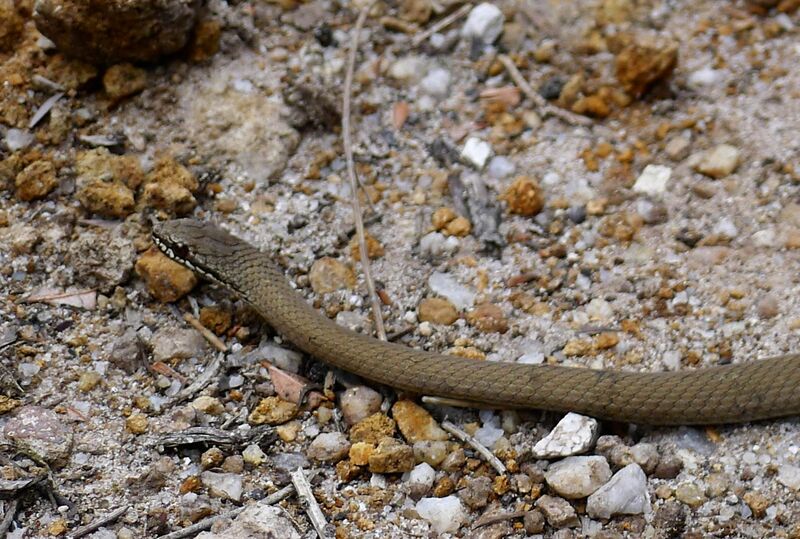 I didn’t see it at first – I was looking for something larger, like a wombat or wallaby. This antechinus was about the size of a guinea pig – not that it looks anything like one. It was eating something at the base of a small stand of brakenfern, then hopped off. Given it’s a carnivore, it’s most likely to have been eating an insect or invertebrate. Since I didn’t get my own photo, this one comes from p98 of my copy of “The Mammals of Australia” (ed Ronald Strahan, 1995, Reed New Holland). The vegetation changes noticeably on the other side of the saddle. Gritty pathways through a forest that has been opened from landslides and forest fire changes to (very) muddy ones through close sassafras(? ), stringybark, ferntrees – generally very wet and mossy forest. The track descends down to the boardwalk across Sealers Swamp which, at about 1.5km long is an impressive structure through some of the most beautiful parts of the walk. The beach at Sealers Cove is well worth the walk. We were glad that it wasn’t raining when we arrived and we could enjoy our lunch by the beach, watched closely by a silver gull. It’s a very muddy path – glad we were wearing gaiters! Boardwalk construction – took quite a bit of effort! Sealers Cove! Just over the dune. Heading back, we passed another hiker on the boardwalk section, who was carrying a much smaller backpack than either of ours. We didn’t expect any day walkers behind us – we thought we were leaving things a bit late as it was! There had been other people on the path though. Earlier we had passed maybe half a dozen other – mostly overnight – hikers all up coming back up the track – one of whom was bare-footed! Determined to keep up with Stephen on the trek back up the path, the camera stayed mostly unused in hand, or safely sealed in a zip-lock bag in my pocket to protect it from the rain and brief hail storm on the way. There was only one rumble of thunder and flash of lightning – nothing too exciting. I was mostly concerned about the size of the hail that might be pelting down on the car back at the carpark! Reaching Windy Saddle we were a little disappointed (but not very surprised) not to catch unaware any other Dusky Antichinus – or interesting native critter. The sun rays through the clouds and mist as we made our was down from the pass was stunning. Against the burnt tree trunks (from the fires of 2005) the contrast to the soft sunset was stark. In fact, that starkness inspired me to do something I don’t generally do – mess around with creating black and white versions of photos. Some of them work out ok, I think. 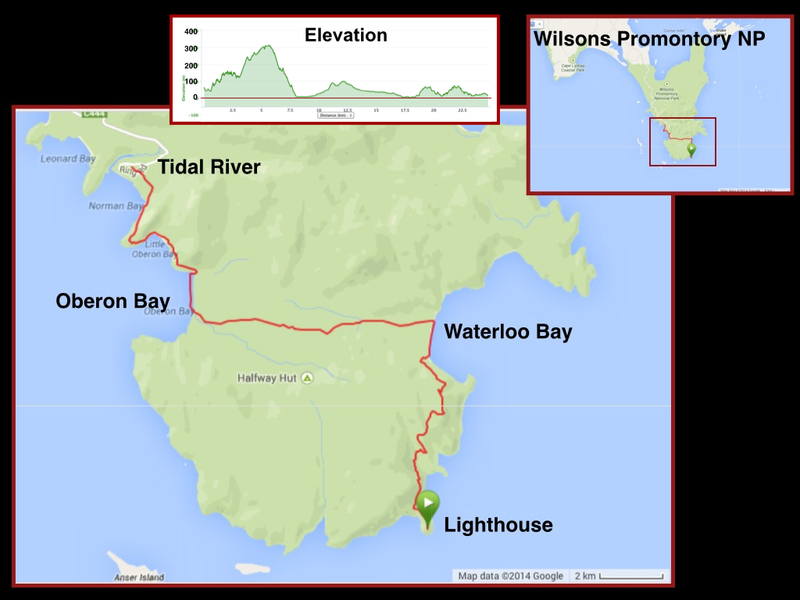 The story gets better – it turns out his original plan was to not just walk a little further than we did, but do the loop around Refuge Cover and Waterloo Bay, and then back up Telegraph Track all in one day. All 35.5km of it! There are three camping spots along this route and I doubt anyone one would recommend doing it in one go. He started his walk at about noon – expecting to complete the walk in half a day! Sure, he can do 20km in good time, but we really thought he was taking on more than he surely knew with this plan. We were pleased that we had completed our walk before dark – and in well under the official time frame. Here is the map and stats from today’s walk – a much more satisfying 18km in 5hrs (including our lunch stop). Not bad. I was pleased to finally have completed a decent (ie long) walk, as our holiday time was quickly running out! 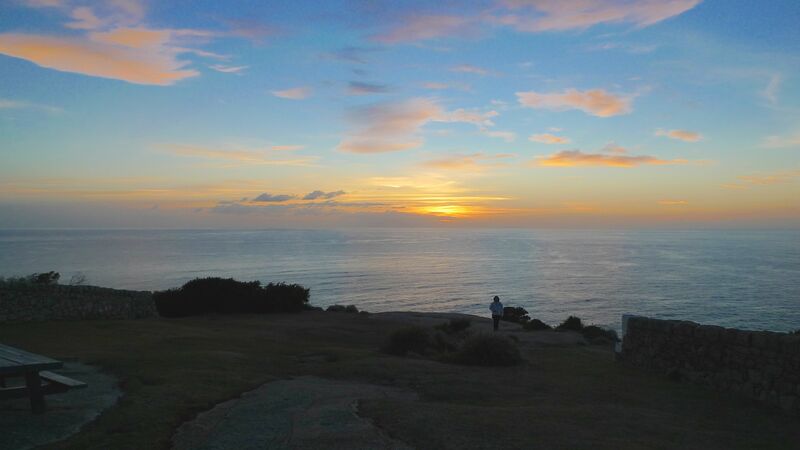 The holiday continues in Wilsons Promontory NP – Part 2 (coming soon) in which I’ll post photos of Oberon Bay, sunset from the summit of Mt Oberon, and the best sunrise yet! Categories: Holiday, Victoria | Tags: Black Cockatoo Cottages, Cape Liptrap, Corner Inlet, Dusky Antechinus, Gippsland, Millers Landing, National Park, Park Victoria, photography, Sealers Cove, Sunrise, The Prom, Tidal River, Waratah Bay, Wilsons Prom, Wilsons Promontory, Wilsons Promontory National Park, Yanakie, Yanakie Caravan Park | Permalink.